Today is probably the most important day in the history of the international working class. Ninety seven years ago workers, sailors and soldiers under the organisation of the Russian Social Democrat Workers Party (Bolshevik) stormed the Winter Palace, the symbolic centre of Tsarism and latterly the headquarters of the ineffectual Provisional Government. 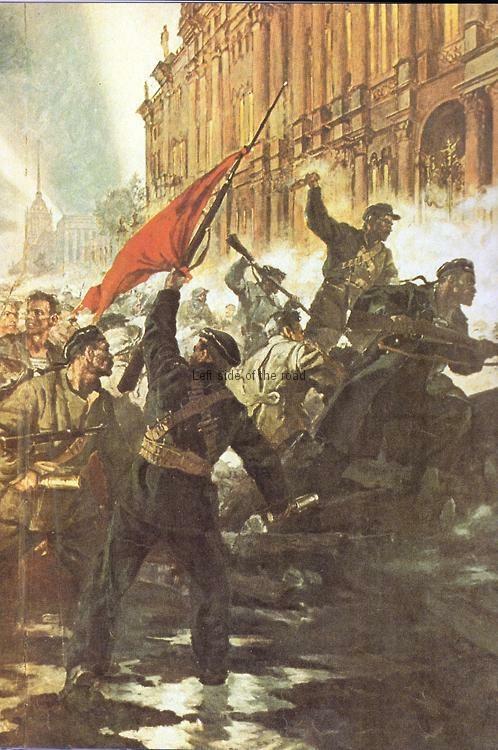 That action took place on, and became known as, the 7th November – The October Revolution. Some people are confused that the October Revolution in Russia took place in November. The simple answer is that the backwardness of the Russian society under the Tsars, an autocratic and theocratic state, was demonstrated not only by its almost feudal relations with the peasantry but also by the fact that the country was still using the Julian calendar which had been dropped by most other countries hundreds of years before. This meant that the day that saw the cruiser The Aurora fire the shot to signal the beginning of the attack on the palace was reckoned as the 25th October in Russia but the 7th November elsewhere. As soon as was practically possible the new Bolshevik government brought the country into the 20th century, at the end of January 1918, by adopting the more accurate Gregorian calendar. Although this revolution was to change the course of history, as no other had done in the past, it was relatively bloodless on that chaotic morning. There used to be a ‘joke’ in revolutionary circles that there were more people injured in the making of Sergei Eisenstein’s 1928 film ‘October’ (recreating the events of just over a decade earlier) than the real event. If reaction and oppression couldn’t stop the revolution at the time it did all it could in the next 4 to 5 years to strangle the nascent workers’ and peasants’ state. Those imperialist powers that had been slaughtering each other (or more exactly had convinced their own workers to kill fellow workers of different countries) for almost four years – the start of which is now being cynically and hypocritically commemorated at this moment – banded together against a common enemy, the working class. But under the leadership of the party that was to become the Communist Party of the Soviet Union (Bolshevik) and its great leaders, Vladimir Ilyich Lenin and Joseph Vissarionovich Stalin, the workers and peasants prevailed and started along the difficult and uncharted road towards Socialism. The reason that the Party, having to surmount unimaginable obstacles and at a great human cost, was due to the Bolsheviks keeping their promise to the Russian people, downtrodden in both the countryside and the cities and tired of the slaughter that was the First World War. The very day after the revolution (26th October) a decree giving land to the peasants was passed and the following day (27th October) the Bolsheviks declared that they were not prepared to continue with the crime of worker killing worker. Revolutions are not the same as dinner parties, as Chairman Mao said, and however well they are organised they rarely go to plan, there being too many variables and this happened to the intention to cease military action on the eastern front. Foolishly Lenin gave the task of the negotiations with the German High Command at the city of Brest-Litovsk to the recent ‘convert’ to Bolshevism Leon Trotsky. Attempts at revolution in Hungary and German came to nought and the other capitalist nations went through crises and economic depression without the workers following the lead of the Soviets, thereby weakening themselves and the first socialist state. Being the first is always difficult. Mistakes, as well as many successes, were made but capitalism never tires in its aim to maintain the system of oppression and exploitation. Whilst it had failed in the intervention with the 14 nations in the Civil War it hoped that the Fascists in Europe would finish the job. Unfortunately for imperialism the dogs of war decided to go for the easy touch first and France, Belgium and the Netherlands capitulated at the first opportunity and the British had to scuttle back across the English Channel, a disorderly retreat which is now depicted as a victory. But the megalomania of the Nazis knew no bounds and it was inevitable that they would seek to destroy socialism in the Soviet Union. However, at a huge sacrifice in terms of human life and the material advances that had been made since the end of the Civil War (with industrialisation and collectivisation) the ‘Thousand Year Reich’ was utterly destroyed. The men and women of the Soviet Union had saved the world from Fascism. Although defeated on the battlefield Fascism did have the effect of weakening the Soviet Union, the best and most committed communists being prepared to make the supreme sacrifice in order to save their revolutionary gains. This meant that when the revolution was attacked this time from the inside, following the death of Joseph Stalin in 1953, those revisionist elements within the Communist Party of the Soviet Union were able to move the country off the road of socialism. The Soviet Union as an entity ceased to exist in 1991 but it ceased to be a socialist country long before that, the date being accepted by most Marxist-Leninist is that of the time of the 20th Congress of the CPSU in February 1956, when Khrushchev made his attack upon Stalin – but really on the whole concept of revolutionary socialism. But in the same way that the October Revolution was made by the people so the defeat of that same revolution less that 40 years later was also the responsibility of the Soviet people. If they are treated as nothing more than pawns by their rulers then they have accepted that situation. If the working class is the class to move society to a higher level they can’t then cry that they are victims of forces beyond their control. The slogan ‘ye are many, they are few’ is as valid today as it was when Shelley wrote the line almost 200 years ago. Notwithstanding the fact that the Russian people have seen virtually all the advances made in those 40 years of socialism destroyed completely in the last 20 or so years, with gangsters and thieves using the natural wealth and the labour of the workers to buy football teams, huge yachts, a myriad of palaces and countless whores no one can take away from their grandfathers and grandmothers the achievements they made in the first half of the 20th century. The men and women who make revolutions are rare and if a country can produce such a generation once in a millennium they are doing well. Despite the arrogance that oozes out of the capitalist propaganda machine that socialism is dead what those men and women started on 7th November 1917, the October Revolution, will forever be a beacon to the oppressed and exploited of the world. This entry was posted in November, Revolutionary Year and tagged lenin, marxism-leninism, october, revolution, russian, stalin by Michael. Bookmark the permalink.